Paul Hudson was the hero as the Dubs were given a scare at Cusack Park today. Michael Fitzsimmons of Dublin with Paul Sharry of Westmeath. PAUL HUDSON PERFORMED the super sub role in Mullingar with a burst of late scoring to help holders Dublin shake off determined Westmeath. A 50th minute Westmeath goal from veteran star Des Dolan shortly after his introduction levelled the game. But seven Dublin points in the last 15 minutes, including four from Hudson, eased the holders to victory and maintained their perfect start to the campaign. Dublin were wasteful overall, shooting 13 wide and missing several good goal chances as Westmeath ‘keeper Darren Quinn starred. But Hudson was clinical after his 51st minute introduction and booted three points from play in the closing stages, as well as a free, to give them breathing space. Westmeath actually led 1-5 to 0-7 after 54 minutes but back to back Hudson points gave Dublin the impetus to surge clear again. It was a repeat of Jim Gavin side’s O’Byrne Cup win over Westmeath at the same venue last month. Ciaran Kilkenny kicked the winning point that afternoon and opened the scoring again this time. But Dublin couldn’t stride confidently clear as expected and led just 0-6 to 0-3 at half-time despite having more of the play. Missed chances cost them dear with eight first-half wides and both Paul Flynn and Michael Darragh Macauley wasted goal efforts early in the second-half. They were made to pay by Dolan who hit an incredible goal 20 minutes from time to give Westmeath real hope. But the strength of Dublin’s bench was apparent as Hudson came in and changed the game while Davy Byrne also hit an important point. Scorers for Dublin: Paul Hudson 0-4, Ciaran Kilkenny (0-3f) and Stephen Cluxton (0-3 45) 0-3 each, Ciaran Reddin 0-2, Kevin McManamon and Davy Byrne 0-1 each. Scorers for Westmeath: John Heslin 0-5 (0-3f), Des Dolan 1-0, Kieran Martin and Ray Connellan 0-1 each. DUBLIN: Stephen Cluxton; Philly McMahon, Michael Fitzsimons, Darragh Nelson; Eric Lowndes, Cian O’Sullivan, Jonny Cooper; Michael Daragh Macauley, Shane Carthy; Paul Flynn, Ciaran Kilkenny, Ciaran Reddin; Paul Mannion, Eoghan O’Gara, Kevin McManamon. Subs: Jack McCaffrey for Macauley (40-45, blood), Paul Hudson for McManamon 51, Kevin O’Brien for Nelson 51, Davy Byrne for O’Gara 58, McCaffrey for Macauley 60, Daniel Watson for Mannion 63, Kevin Nolan for Cooper 67. WESTMEATH: Darren Quinn; Kevin Maguire, Kieran Gavin, Steven Gilmore; Jamie Gonoud, John Gilligan, James Dolan; David Duffy, Denis Corroon; Paul Sharry, John Egan, Ger Egan; Kieran Martin, Denis Glennon, John Heslin. Subs: Ray Connellan for Maguire (24-25, blood), Connellan for Corroon (25), Des Dolan for Martin (48), Callum McCormack for Gonoud (63), Damian Dolan for Gilmore 68, David McCormack for Glennon 72. Email “Dublin too good for determined Westmeath side”. 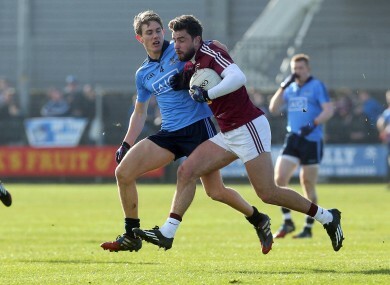 Feedback on “Dublin too good for determined Westmeath side”.